Beyond Exile, the long awaited sequel to J.L. 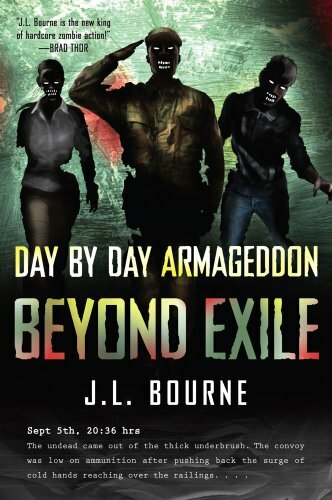 Bourne's bestselling zombie novel Day by Day Armageddon is now available! The first book in the Day by Day Armageddon saga took us deep into the mind of a military officer and survivor as he made a New Year's resolution to start keeping a journal. The man kept his resolution and brought to us the fall of humanity, day by day. We see the man transition from the life that you and I live to the prospect of fighting for his very survival against the overwhelming hordes of the dead. We see him bleed, we see him make mistakes, we witness him evolve. The highly anticipated sequel to the bestselling underground cult classic begins where the first novel left off. Armies of undead have risen up across the U.S. and around the globe;there is no safe haven from the diseased corpses hungering for human flesh. But in the heat of a Texas wasteland, a small band of survivors attempt to counter the millions closing in around them. Day by day, the handwritten journal entries of one man caught in a worldwide cataclysm capture the desperation--and the will to survive--as he joins forces with a handful of refugees to battle soulless enemies both human and inhuman from inside an abandoned strategic missile facility. "DAY BY DAY ARMAGEDDON is hands down the best zombie book I have ever read."